â¢ The U.S. elections are a week away. Voters will head to the polls next Tuesday in a midterm election that could shift control of Congress â and potentially give Democrats much more oversight of President Trump. Republicans are trying to hold on to their majorities in both chambers. Hereâs the latest thinking on whether the Democrats will be able to flip the House and the Senate. â Gender: A record 257 women are running, many of them Democrats. Thereâs a surge of energy among female voters, fueled by Hillary Clintonâs loss in 2016 and the #MeToo movement. â¢ Indonesiaâs air safety record is tarnished again. 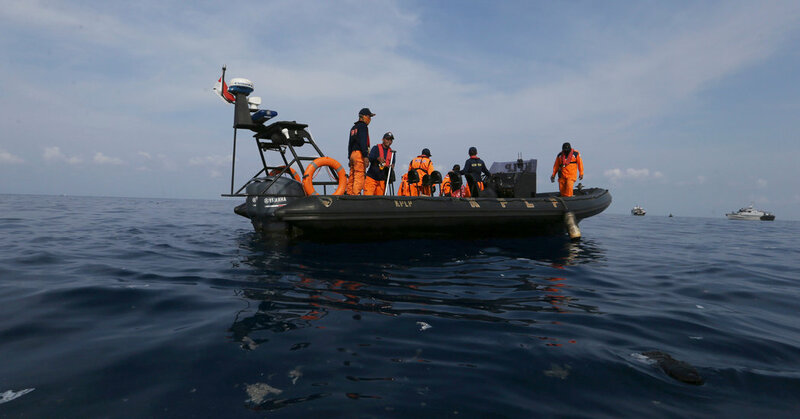 All 189 passengers are feared dead on a Lion Air flight that took off from Jakarta, the capital, and crashed into the Java Sea on Monday. Above, the search and rescue operation. The cause wasnât clear, but the crash underscored the troubled safety record of Indonesiaâs rapidly expanding aviation sector. Passenger traffic in the country tripled from 2005 to 2017, to an estimated 97 million. But Mondayâs crash was the latest of at least 15 episodes involving Lion Air â which controls as much as 51 percent of the domestic market â since 2005.
â¢ Cornell cuts ties with Chinese school. Cornell University said it would end a research and exchange program with Renmin University in Beijing, after the school punished at least a dozen students who campaigned for Chinese workersâ rights. The student activists described themselves as followers of Mao and Marx and said they were fighting to defend the working class and the legacy of communism. But the authorities have been trying to suppress student dissent, wary of the discontent associated with Chinaâs shift to capitalist markets. Cornellâs decision was a rare rebuke of Chinaâs human rights restrictions; many American universities, seeking money and global presence, have compromised and accepted Beijingâs approach. â¢ What China has to do with Sri Lankaâs political crisis. India and China have been locked in an expensive competition for influence in the country. When President Maithripala Sirisena, above, took power in 2015, he ran on an anti-China platform. He replaced Mahinda Rajapaksa, who had moved the country closer to Beijing. The election was considered a win for New Delhi. But he came to realize that India didnât have Chinaâs deep pockets. So he began to gravitate toward Beijing once again. And now heâs trying to orchestrate the comeback of Mr. Rajapaksa, his predecessor, naming him his new prime minister in an attempt to oust a political rival. All this has thrown the country into a crisis, with concerns that violence may be used to break the stalemate. And China may benefit from the turmoil, to Indiaâs loss. â¢ Campbell Soup decided to âaccelerateâ the retirement of an executive who shared a conspiracy theory on Twitter that linked the migrant caravan in Mexico to George Soros, a Jewish billionaire who was a target of the pipe bomb campaign last week. â¢ Chinaâs roster of billionaires grew by a net total of 55 last year, to a grand total of 373, according to a new study. The countryâs superrich are generally younger than their global counterparts and create wealth faster. â¢ That list includes Zhang Yiming, founder of Bytedance. Itâs a Chinese video-sharing company that you might not have heard of â but the nearest teenager probably has. And itâs worth roughly $75 billion. â¢ U.S. stocks were down. Hereâs a snapshot of global markets. â¢ After his character died on âThe Walking Dead,â the Asian-American actor Steven Yeun, above, started looking for more three-dimensional roles that broke with stereotypes. He found them in South Korea. âYou donât have to be reminded of your otherness there,â he said. â¢ After a magical solo trip through the Black Forest over a decade ago, our Books editor returned to Germany, this time with her three children, to recreate the fairy tale, journeying to castles and barefoot parks and violin-making towns. â¢ And todayâs word is groutier: It means sulky or bad-tempered. The adjective helped Nigel Richards, who is from New Zealand and lives in Malaysia, win his fourth World Scrabble Championship. The government ultimately decided against pursuing that path, settling for the annual cap instead. Britain, Ireland, Australia, New Zealand and Italy put similar limits in place. Although the program was announced with little warning to limit hoarding and prevent a run on shoes, its stipulations were far-reaching. Babies were not exempt. Aside from the quantity limits, the program also curtailed the styles and colors of shoes available, with black, white, town brown and army russet in, while wingtips and heels exceeding two and five-eighths inches were out. After the program ended, some consumer behaviors that developed during the rationing period stuck, with casual shoes that had become popular under rationing continuing to drive demand. The year 1946 was on track to be what a report in The Times called one of the âbest-shodâ years in history. Nadav Gavrielov wrote todayâs Back Story.